I’m currently back in Ohio for a visit for the first time since I’ve started this blog, so I can finally begin to remedy my neglect of my old home state. Obviously, NE Ohio (or Cleveland+, as I believe they’re trying to call it now) has can’t compete with the history, and consequently, the number of museums in Britain, but it’s not a total cultural wasteland. The first place I’ll discuss is one I visited last weekend – the National First Ladies’ Library. You may be thinking to yourself at this point, “What? The National Library dedicated to all the First Ladies is in some city in Ohio I’ve never heard of? !” Well, yes it is, and what’s more, it’s not even terribly big, and was only founded in 1995 . A rather shameful neglect of the poor ladies if you ask me. The reason it’s in Canton, so far as I can tell, is because the founder of the organisation lived there, and because Ida Saxton McKinley‘s home was available to house the library. Ida Saxton McKinley, as you may recall from a much earlier post, was the sickly wife of William McKinley, the president who is probably most famous for starting the Spanish American War, and for being assassinated at the Pan-American Exposition in 1901 (for more reading on McKinley, I’d recommend The President and the Assassin, which is surprisingly riveting). She was something of a local belle, and had a rather large mansion in Canton, which served as the McKinley family home for a number of years. However, it is not the same house as the one in McKinley’s famous “Front Porch Campaign,” as the family had moved out in 1891. Still with me? All right, so the set-up of the First Ladies’ Library is somewhat confusing, and the website doesn’t explain it very clearly, but fortunately my mother had visited a number of times before, so she knew the drill. The library (which is actually a museum, at least as far as non-scholars are concerned) is divided between two buildings in downtown Canton, which are separated by a few parking lots. After parking in one of them (for which you’ll have to buzz the library to get the access code to open the gate), you first proceed to the old bank building, which houses the temporary exhibits. There you’ll pay admission, normally $7, though free on the day I visited, and receive a brief introduction to the collections. During my visit, the theme was First Ladies and the Press, and the displays consisted of twelve miniature replicas of dresses worn by various First Ladies, correspondence between (you guessed it) First Ladies and the press, White House china, and other memorabilia. The most interesting things were probably the old newspapers, which I was meant to be reading for the obituaries, but the advertisements in them were just as intriguing. 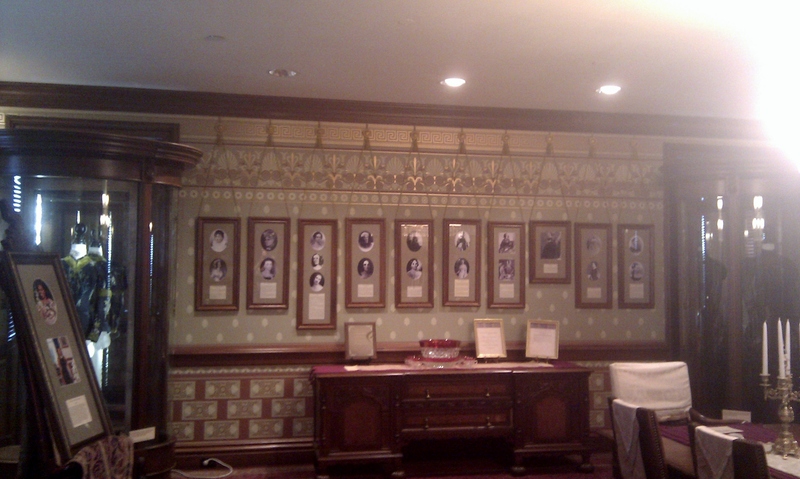 The film room was adjacent to the main display room, and featured six short films. I watched one on invalid First Ladies, and I have to say that they stretched the definition of the Victorian era quite a bit, as it does have finite dates, and calling Ellen Wilson and Elizabeth Monroe Victorian First Ladies is not entirely accurate, especially as Elizabeth died 7 years before Victoria even took the throne. The content was also lacking – because it was so short, it only offered the briefest overview, when I would have liked detailed information on their specific conditions. It only took about half an hour to look around the bank building and watch a couple films, as the collection was quite small. However, tours of the next site, the McKinley house, are only offered once an hour (on the half an hour), so time your visit carefully. Because there were so many people waiting (probably on account of the free admission), they offered a 2 o’clock tour, but I’m not sure if that is normally the case. Now, one of the many, many things I hate is guided tours. There’s inevitably always a couple of people who push ahead and then stand in front of things so you can’t see them, and another person who will ask really stupid questions. 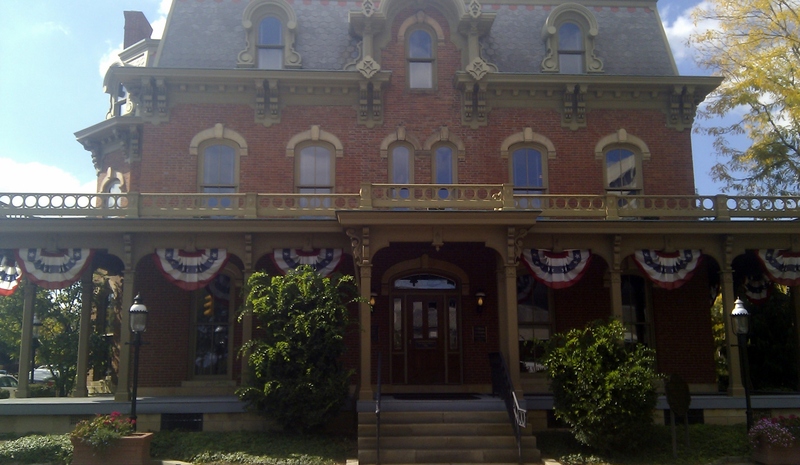 However, it is the only way to see the Saxton McKinley House, so I sucked it up and went along with the crowd. The tours are done by a costumed guide in the guise of one of the First Ladies; on my tour, we got Sarah Polk. She wasn’t actually in character or anything, she was just wearing a hoop skirt, and told us she was meant to be Sarah Polk. She didn’t even regale us with any specific Sarah Polk facts. The McKinley home is a pretty standard American Victorian affair, lots and lots of green wallpaper (presumably reproductions of the original Scheele’s Green, which was made with arsenic) and knick-knacks everywhere (clearly the American nouveau riche didn’t share the disdain of the British upper classes for tat). The rooms were perfectly lovely, if you’re into overdone Victorian decorating (which I kind of am), but not especially noteworthy, save for one on the third floor which was like another small museum, and had a plaque on each of the First Ladies, as well as some of their artefacts, including two of Ida’s dresses. The thing to remember about the First Ladies is that they weren’t necessarily all just the presidents’ wives; in the case of widower or bachelor presidents (I’m looking at you, possibly secretly gay James Buchanan!) they were nieces or daughters or whoever wanted to assume the entertaining duties; Dolley Madison took on the job for Thomas Jefferson, which led to rumours of their having an affair. So the plaques were really quite interesting, but I rather wish they had been in the bank building instead so I could have had more time to study them, as time was limited within the confines of the tour. As these sorts of things do, the tour ended in the gift shop, which has a few postcards, and some books on the presidents and First Ladies that looked appealing, though not appealing enough to pay standard retail prices I guess (I might consider it if I’m ever not completely broke). It’s hard to rate the First Ladies’ Library, because I appreciate what they’re trying to do, and I’m glad someone is out there doing it, because I’m fascinated by presidential history, and I think the stories of the First Ladies need to be told as well. In addition to this, the Saxton McKinley house was in a complete state of disrepair when they were given it and they’ve obviously completed extensive renovation work based largely on photographs of the original house. That said, I think something was lacking in the whole experience, and the collections were small and limited; the library is run in conjunction with the National Parks Department, and they need to pour a lot more money into it (although that seems unlikely, particularly with the current state of affairs). They do put on special events from time to time, like teas, which my mother has attended and enjoyed, and she said that she’s had better tours as well; obviously it depends which volunteer is running them, so your experience may vary. 3/5, but I’d love to see some big improvements, because it’s a fascinating subject matter, and I’d like to see them thrive in future.